Last week I told you about the amazing Ribfest extravaganza I attended at the Meyers', giving you just a little taste of the the spectacular dishes that were featured. 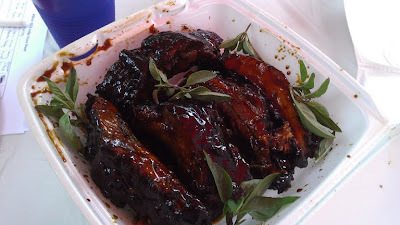 But today, we get in a little deeper, as I unveil the winning recipe that received the big kahuna prize for best ribs. Give it up for Adam everybody! Adam's Thai-style ribs made a big time impression on us all, not just with their strong, in-your-face flavor, but also with the creativity in ingredients that were used. Here, Adam shares his recipe, so we can all practice making his ribs just because, or for an upcoming rib extravaganza of our own perhaps. Sauté the onion, garlic, chopped pepper, and a pinch of Thai basil in the butter until soft and pungent (caution: Thai pepper produces some tear gas). Add the liquid ingredients starting with the fish sauce, then adding molasses and other ingredients, reserving the sriracha and Thai basil. Cook until a light boil, back off to a low heat, and simmer 1 hour, add sriracha to taste and Thai basil and cook at least 30 minutes.